Picture this: tables set with platters of what look like chicken-flavored Jell-O molds (kholodets), sloppily poured vodka shots and red and white Santa hats; cheesy holiday song-and-dance performances blaring from nearby televisions. That, in a nutshell, is how Russian Israelis celebrate their most culturally distinctive holiday—Novy God. It’s easy to write off Novy God (Russian New Year, which begins on January 1) as a bizarre and colorful ritual—far from anything that could be considered Jewish—but the fact remains that it is the No. 1 holiday for those who immigrated to Israel following the fall of the Soviet Union more than 25 years ago. In that time, Israel has absorbed more than 1 million Jews from Russia and former Soviet republics such as Kazakhstan, Belarus and Georgia. These Jews didn’t bring much with them—a few possessions, a strong work ethic and their culture and cuisine. My husband, Eli, and his family were among the many new Russian immigrants who landed in Israel in January 1990, unsure about their new country, so radically different from Ukraine, their former home. It is through them that I learned about Russian food and culture. Cabbage, potatoes, mushrooms, beets, pickles, sour cream, garlic, cherries and dill. These are the foods and flavors that have come to taste like home to me, and to my children as well. With that context, I see Novy God through my in-laws’ eyes. It is understandable how this holiday could be misunderstood—there’s a lot of drinking and revelry. It can seem from the outside like a secular, Christmas-like holiday, no doubt because of the decorated tree and gifts handed down by Grandfather Frost. While most children of Russian immigrants have grown fully into Israelis, the older generations experienced a broken link when it came to Jewish customs, practices and holidays. Novy God was their major chag. And so, all the holiday energy and good cheer was funneled into Novy God. It is one of few nights a year when Russians in Israel honor their unique cultural heritage with a heavy dose of nostalgia for the old country. 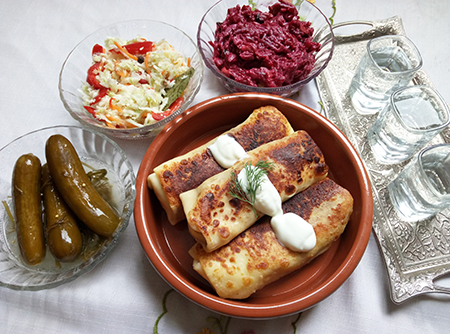 Luckily, since Novy God is a feast of epic proportions, and I include recipes here for you to recreate some of these flavors at home (think cabbage, potatoes, pickles, blintzes—yum!). Nazdarovya, cheers! And Happy New Year (s novim godom)! Makes about 13 large blintzes. These blintzes are coming to you straight from my mother-in-law, Galina’s, kitchen. They were among the first recipes I learned from her. Over the years, I have tried different recipes for blintz shells, but none has ever come out quite as well. To ensure success, make sure you start with a good frying pan that is not known to stick. The filling is a combination of two of my favorites things—buttery potatoes and mushrooms. Finished blintzes can be eaten as is, seared in a pan with hot oil or, for an American touch, topped with melted cheddar cheese. They can be eaten hot or at room temperature, but always with a dollop of sour cream on top. Make blintz filling: Heat 2-3 tablespoons of oil in a pan, and sauté cleaned, sliced mushrooms. Add salt, pepper and granulated garlic to taste and cook until mushrooms turn deep brown. Set aside to cool. Place potatoes in a large pot filled with cold water. Bring to a boil, then simmer until tender (about 30 minutes). Once tender, drain and mash potatoes until broken down. Add butter and let melt. Stir in milk, salt and pepper to taste. Stir in sautéed mushrooms, and set filling mixture aside to cool while making the blintz shells. Make blintz shells: In a large bowl whisk flour, sugar and salt. Add cold milk, eggs and oil, and whisk again until smooth. Add hot water and whisk until smooth. Lightly grease a large frying pan with vegetable oil, wiping away any excess oil. Heat to medium-high heat, and pour one ladle-full of blintz batter into the hot pan, quickly rolling it around to evenly cover the entire pan’s surface. Cook until edges pull away from the pan and the middle appears dry. Flip to the second side with the aid of your fingers and a wide spatula. Let the blintz cook for 10-20 seconds on the second side, and then slide it off onto a plate, making sure the cooked blintz shell lays flat. Repeat until there is no more batter. Fill the blintzes: Arrange a half-cup portion of blintz filling in an even line along the bottom of the blintz shell. Roll up once to cover the filling, then fold each side inward like an envelope and continue rolling to achieve a classic blintz shape. For a professional touch, heat 2-3 tablespoons of oil in your pan and sear the top and bottom of the blintzes. Top with a dollop of sour cream and serve hot. Another Galina staple, her special touch is using sliced prunes to add a sweet complexity. The mayonnaise adds an almost butter-like finish here, while not inhibiting the Bordeaux-color of the cooked beets. 2 medium beets, boiled and shredded. Cook the beets: Wash beets then place whole and unpeeled in a medium saucepan with water. Bring to boil, then reduce to a simmer, and cook until tender, about 40-60 minutes. Once tender, spill out hot water and replace with cold water over the beets. Set aside to cool. Once cooled, peel the skin of the beets of by rubbing them between your fingers (if beets are cooked through, the skin will fall off easily). Coarsely grate beets over a medium bowl. Add chopped walnuts, prunes, grated garlic, mayonnaise, lemon juice, salt and pepper, and mix to combine. Taste and adjust seasoning if necessary. A cousin of German sauerkraut, Russian pickled cabbage is subtle and slightly sweet. With the addition of carrot and sweet peppers, it becomes a palate-cleansing side salad, which works well alongside heavier accompaniments or as part of a light meal made up of many components. In a large pot, place prepped vegetables, garlic cloves, peppercorns and bay leaves. In a small cup, melt salt and sugar in 1/4 cup hot water. Pour hot water mixture over the vegetable mix and top with the filtered water. Stir to mix. Press an inverted plate down over the mixture and let sit at room temperature for 3 days. 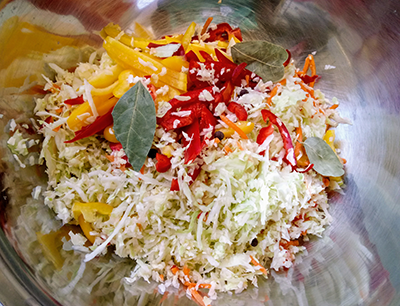 After 3 days, remove peppercorns and bay leaves, then store the salad in the fridge until ready to eat. I have gone pickle crazy over the years, tweaking my recipe until arriving at this perfected version. 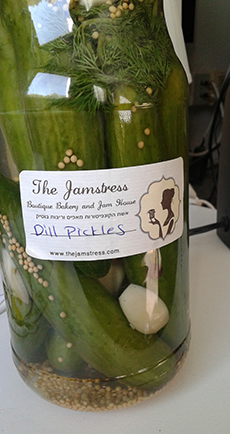 For me, it’s something quite special, since real dill pickles are hard to come by in Israel. It literally takes a minute or two to throw these together, and a couple short days to reach fresh, flavorful results. Clean a large Mason jar with hot, soapy water and dry completely. Place peeled garlic cloves, peppercorns and mustard seeds in the bottom of the mason jar. Thoroughly wash each individual cucumber to get rid of any dirt, then pack them down into the mason jar. Push dill down into the jar as far as possible. Mix salt with hot water and stir to dissolve. Pour hot water mixture over the top of the cucumbers, then top with filtered water, leaving room at the top for the vinegar. Add vinegar, then turn jar gently to stir up the contents of the jar. Let sit on your counter for 2-5 days, until cucumbers turn from forest to olive green. Store pickles in fridge. love this piece. such a great writing.